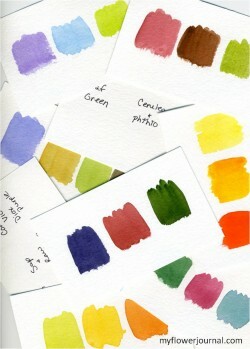 I recently painted some color swatches in watercolor inspired by a magazine I bought at Barnes and Noble. 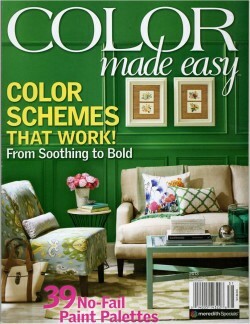 The magazine, Color Made Easy, (new issue) is filled with decorating ideas in different color themes. Most of the pages have swatches of the paint colors used on the walls. Its a fun magazine to look through, but it was the color swatches that caught my eye. I decided to go through the magazine page by page and try to mix my watercolors to match the paint swatches and make my own color cards. I think you could do this project with any decorating magazine. 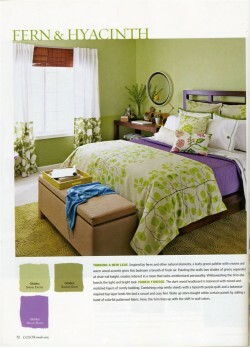 Even if they don’t show color swatches you could mix the colors used in the room decor. I cut 140 lb. watercolor into 3×5 cards to paint the color swatches on. On the back of each card I wrote the paint colors I mixed to create each color sample. It was a fun way to practice mixing colors and a good way for me to find new color combinations to use in my art. I also learned that I have a good selection of watercolor paints that I can use to mix a variety of colors. 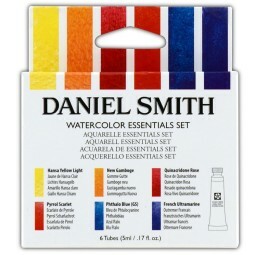 *****January 2016 update: After taking a watercolor class on Craftsy I now use the Daniel Smith Essentials Set (a limited palette) plus a few favorite colors for most of my watercolor projects. In this class we did similar exercises to learn lots of ways to mix these basic colors. 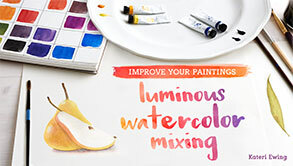 I encourage yout to take this class or make color charts or swatches with your paints. Its a great way to improve your paintings. 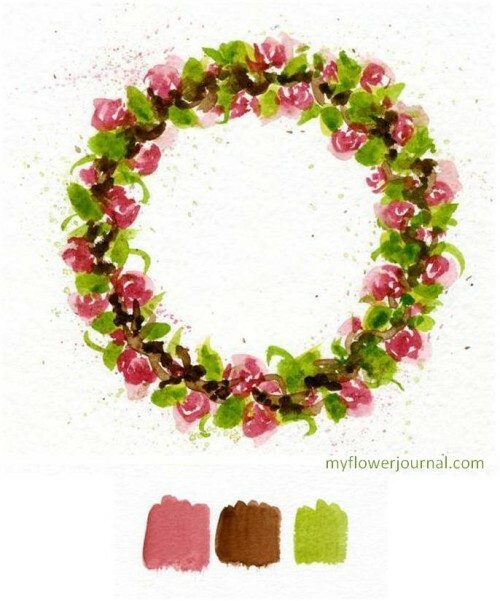 This tutorial shows how I paint my watercolor wreaths. 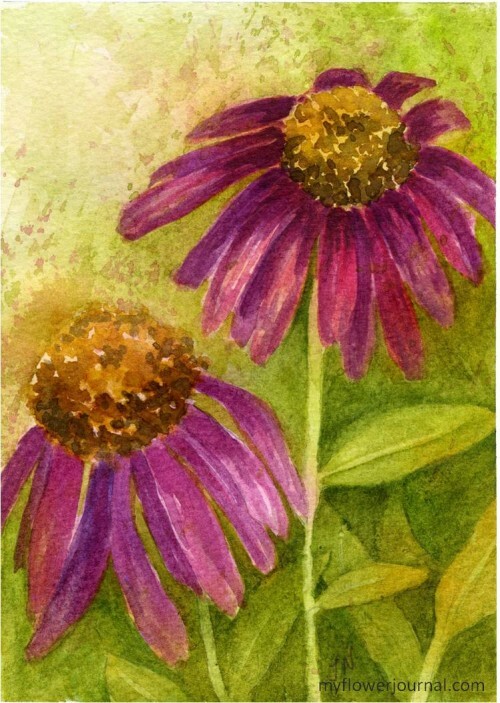 Tried a little more negative painting in this 5×7 watercolor of purple cone flowers. I also LOVE your paintings. I watercolor paint & need to settle down & get to work on some cards. Love the purple cone flowers. Tammy, you have such talent. I really want to try doing some of this. I use to teach Tole Painting but haven’t worked that much with water colors. I bought a cute book from Hobby Lobby to do a garden journal. Thought it would be a fun winter project. Will try some. Thanks for sharing your wreath tutorial! Love these bright happy bunches of colour & garden – Awesome! Your flowers are just awesome. Wonderful. So beautiful! I love these colors! 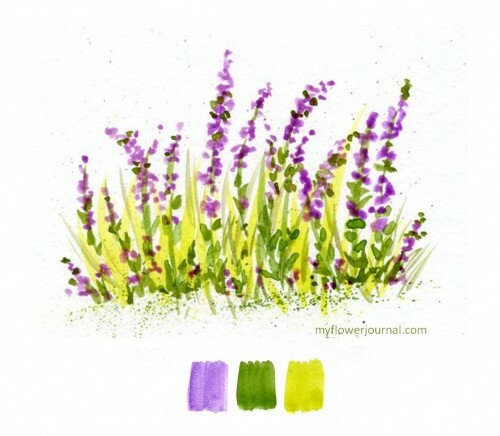 Lovely sketches, beautiful color schemes! Nice ! I too love that light celery green and purples together. What a great inspiration and a great way to start off a painting! These are all so beautiful and delicate, I can smell the fragrance from all these sweet flowers! Your post is very beautiful! I wanted to let you know that I am viewing your blog through Firefox. For some reason the header at the top of your blog is about twice as wide as blog content. Anyway, I just thought you might like to know that. Hope it helps!